A geodesic is the path a particle takes through space and time. It’s usually quite an esoteric path, full of twists and unexpected changes of course. At each stage along the way it looks smooth, almost peaceful, but when we look back it’s full of zig-zags and noise. A geodesic describes the complete history of a particle, and the particle has no choice but to follow it into the unknown. This week marks the 10th anniversary of when I started my undergraduate degree, so I thought it would be a good time to look back at my geodesic, and look at the obscure path my life has taken since embarking on physics. 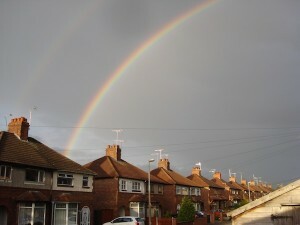 A double rainbow over my hometown of Crewe. What does it mean? !